I don't know how they do it, but Intertops Casino has just launched yet another huge casino bonus giveaway. By Halloween they'll have given away another $120,000! If you make it to the top of the contest leaderboard you can get an up to $500 bonus. Every Monday during the $120,000 Bullseye Casino Bonus event, the top 20 players on the contest leaderboard will receive bonuses. The top 20 get $500, the next 10 get $300 and 20 more get $150. A total of 300 players will get bonuses every week until November 3rd. All you have to do to earn points is play games. I have to admit, I like that little extra thrill of checking my rank on the contest scoreboard, especially if I’m about to bump up to a bigger bonus category. 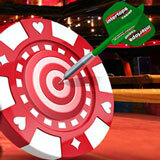 To check your current player rankings and read contest details see http://casinopromotions.intertops.eu/bullseye. If you also play poker or bet on sports remember that you can use the same secure Intertops account to play casino games or poker or bet in the sportsbook, knowing deposits and withdrawals will be hassle-free no matter where you live.